Week 10 highlights of the 2019 college softball season. Jordan Dail had a 12-K performance in the 4-3 upset of UCLA. Photo: GoDucks.com. The winningest coach in NCAA softball reached a huge career milestone this weekend, one of many top performances and highlights from the 10th week of the Division I regular season. Rain cancelled some top matchups, especially over Saturday and Sunday, forcing multiple changes (such as in the Florida State/North Carolina series in Chapel Hill) and cancellations (including Southeast Missouri and Murray State of the Ohio Valley Conference). 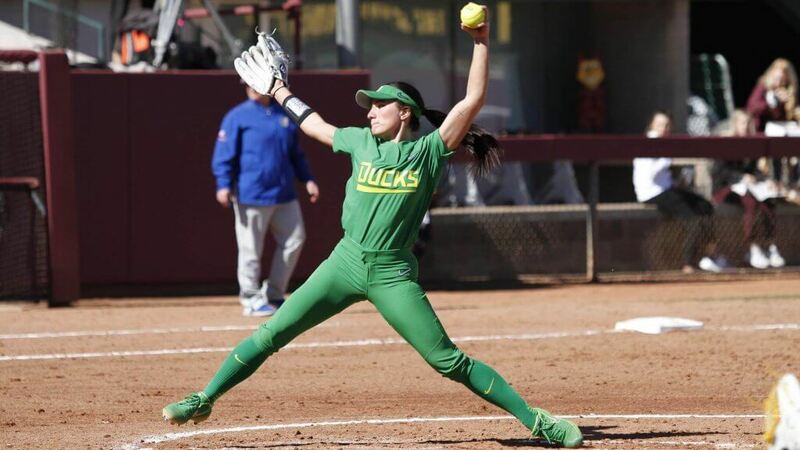 And top-ranked UCLA suffered its first Pac-12 Conference loss thanks to a dynamic pitching performance by Oregon’s lone scholarship pitcher. Few were unsurprised by the happenings in Westwood in the series opener between the Bruins and the Ducks on Friday night. With the #1-ranked Bruins widely expected to easily take the series sweep, Oregon (17-19, 2-8 in the Pac-12) came back from a 2-0 deficit to pull ahead, thanks to a pair of late-inning home runs, and record the 4-3 upset victory. Jordan Dail was sensational in the circle, keeping all but Bubba Nickles in check on the way to a complete game, six-hit, 12-strikeout line and the victory. In a battle of two teams out of the Mountain West conference that have both battled for position early in the season, the Rams rebounded from a game one loss to close out the series with back-to-back victories in the series’ final two games. After losing a 5-run lead in the series opener, the Rams came back and posted a pair of tight victories over the Rebels to finish out the series. The loss in game one was just CSU’s second defeat of the conference season, as they close the weekend 31-6 overall and 13-2 in Mountain West play. Arissa Paulson had herself quite a day on Friday. Arissa Paulson. Photo: Jaren Wilkey/BYU. 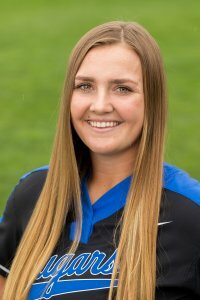 Playing on both sides of the ball in her team’s Friday doubleheader, occupying both the first baseman’s position and the pitcher’s circle in the two games, Paulson was impressive with her arm and her bat. In the series opener, it was Paulson's grand slam in the bottom of the sixth that gave the Cougars the walk-off, run-rule victory over conference rival Pacific, 10-2. Starting in the circle in game two, Paulson finished with a line of 5.1 innings pitched, with six hits, four runs, and seven strikeouts, earning the win enroute to a series sweep for her team. A three-game series sweep of Big Ten foe Penn State marked the Scarlet Knights’ first conference sweep since 2016, ending a near three-year drought in the category for the program. The trio of victories put the Scarlet Knights over the .500 mark overall and quadrupled their previous win total in league play. The series sweep included fourteen runs of offense and holding the Nittany Lions to just four runs in the three games, including a game two shutout.